Reader Question: Hello! I thought I might send over a question or two to get some advice from you and the rest of your readers. My fiance and I are having a potluck dinner after our wedding. The meat will be provided by us--beef from his uncle's small farm, and maybe venison (we're looking into the legality of that one, considering we don't want said uncle to get his hunting license revoked or jail time). The sides will be on our registry in categories like "veggie main dish," "pies," "rolls/cornbread," "fruit plate," etc. for people to register for as their gift to us. We're asking them to bring a card with their name, the name of the dish, and any common allergens or designations (peanuts, gluten-free, soy, vegan, etc. ), as well as a recipe card for us to include in a wedding cookbook. As for the organization of it all, we're asking his three incredibly capable sisters to handle it (the ones who were asking, "Why aren't we more involved in the wedding?? What can we do?? "), and we're getting married at a summer camp, so the camp's kitchen staff will set up the food, replenish it, remove empty dishes, etc. So, my questions are these: What have we overlooked? What potential snags should we watch out for? How did it go for couples who have done this before? Any tips would be appreciated. Thanks! Yeeeesssss! 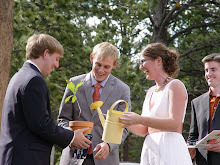 A potluck wedding! Don't get me wrong; I appreciate all kinds of catering options (even this pig roast wedding sounded awesome to my vegetarian ears), but I have a special place in heart for potluck weddings (see my previous post: A Case for Potluck Weddings here). First, I love potlucks. I love the variety of foods to choose from and the fact that people contribute a little piece of themselves to the gathering through their offering. Second, I think wedding potlucks are the best potlucks ever. (I say that more from an inferential point of view, since I've never actually been to a potluck wedding.) I can only imagine how wonderful the food will be when it is cooked by your nearest and dearest in order to celebrate your commitment, community, and love. Wow! Third, potlucks are a huge money-saver. Catering costs can be astronomical. I think potlucks are a magnificent way to seriously scale back a wedding budget AND provide guests with a delicious meal. Fourth, potlucks--in my mind--are the quintessential expression of community. They are a metaphor for what it looks like when each person contributes their small part to the greater good. The outcome is better than the sum of its parts. Fifth, a potluck wedding will be truly memorable. Like I've said, I've never been to a potluck wedding, and they aren't featured very much in the wedding blogosphere. I imagine your guests will truly enjoy the unique experience (and appreciate the opportunity to put their heart and intention into a present, instead of just their cash). Okay, enough gushing. Can you tell I'm really excited for you and your partner? It seems like you've got everything thoroughly planned! I love the idea of the info cards (and the wedding recipe cookbook--what an item to cherish forever!). One thing that comes to mind is serving utensils. Whenever I host potlucks, there are always a handful of people who don't bring serving utensils, so just be sure to have some extras on hand. Also, extension cords. People might show up with crockpots full of goodness and need a place to plug in. My last thought is about sharing all the recipes with all your guests. 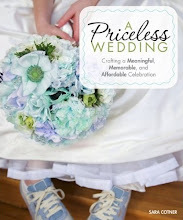 Perhaps you could start a free blog (or use a wedding wedsite?) to scan in the recipes and upload them as photos. I've done this for several recipes, and I think it's pretty easy to read them if folks click on the photos. Ooh! You could even use TasteBook to turn it into a bound cookbook that you give as gifts to people whom you really want to thank. Hmm, I think that's all we've got. 2000dollarwedding kindred spirits, please help us out! Anything else she should anticipate/consider/plan/do? 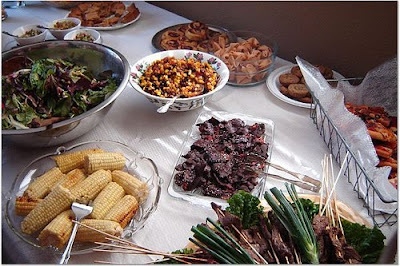 It's much easier also, if you provide utensils, plates, napkins, and drinks, then guests can focus on the food. Also, while the TasteBook/recipe blog is indeed a great idea, I do also worry about guests who will be picking up potato salad at the local grocery store feeling bad that they didn't cook anything. i don't have a suggestion, just a comment. there was a very recent post for potluck weddings on TheKnot forum (titled something like, How Casual is Too Casual?) and this bride got RIPPED apart. only a few of us told her to do it how she pleased, and even suggested your site. one bride said it was tacky to ask guests to bring food and a gift. i had to interject that it was not mandatory that a couple registers for gifts, and maybe they can bring food in lieu of one (hello, can we say "entitlement?"). another bride even mentioned that if the this girl did a potluck her family members would hate her and people would immediately leave and take back gifts off the table. it was complete insanity, and all i could do was scratch my head in wonderment. props to this post, especially because there were soooo many concerns over logictics and not one bright idea on how to overcome it. This is my question! Yay! Thanks so much for the tips so far--extension cords are a GREAT idea. The camp will be providing and washing plates and silverware, but we'll get some back up disposables in case we need a few extra. And we'll be providing the drinks as well, with a responsible friend monitoring the canoe/cooler for anyone who might be overindulging, as the camp is on a cliff. Thanks so much for putting my question up; I'm looking forward to hearing more ideas! Not sure if that would work for you, but I do think it would be nice to consider what the out-of-towners should do. Should they just get a side dish at Whole Foods or equivalent in town, or should they not worry about it? Or some other option? Kudos to you for going potluck! I, too, like the community-building aspect of it. My partner and I were thinking of a potluck, and for logistical reasons, decide against it. But I did take note when a bride on Offbeat Bride talked about using Google Forms to get everyone to sign up for what they would bring: http://offbeatbride.com/2009/10/neo-victorian-weddings It seems like keeping tabs of who is bringing what is the tricky part. 2) FOOD SAFETY. This is not a joke. At said potluck weddings some of the food had very clearly weathered the ceremony, and possibly a long drive in the heat. And had mayonnaise. Yeah, *that* could have ended poorly. 3) Keep in mind there will be a good segment of people that will buy and not make. Come to terms with that emotionally up front. We're always in that group. We always PLAN on cooking, and then Saturday morning is upon us, and we haven't... so we shop. 4) Put someone in charge of organizing that is NOT YOU. For serious. 5) Recipe cards are cute, I don't know if in the real world they are useful (and your guests will think it's cute if you pass them on, but won't actually use it... save the effort if you want). We had a shower like that, and we've never touched the recipe cards. Everyone eats differently, and we eat *very* differently than our (wonderful) 60 year old relatives. Long story short: plan well and it will be great! I too was unfortunate to experience the post on The Knot from the bride who received mostly negative feedback from other brides who thought it was ridiculously tacky to host a potluck wedding and I'd also like to thank you Sara for contributing your more optimistic view on the subject. It's hard to comprehend how vicious people can be. Though I don't have any experience myself with potluck weddings, I'd like to second Meg's suggestion that the organizers on the day of be someone other than yourself (your soon-to-be sisters sound like an excellent choice). Plus, it sounds like you'll have lots of help from the staff at the summer camp which is great! Good luck with everything and be sure to write back to Sara post-wedding so she can let us know how it went. I think we need some more potluck wedding success stories if we're ever going to convince people it's a wonderful way to celebrate on your wedding day! 1. Let your guests know ahead of time what type of food prep/storage is available. Will you have a fridge that's available to everyone? Heating elements? Prep station (if they need to assemble something closer to the eating time)? This may seem silly, but what I would bring to a potluck would depend on all of the above. 2. If you know that some of your guests have allergies that just being around the food can trigger, make people aware of this. Peanut allergies can be triggered just by being nearby, so you may want to ask everyone to be nut-free. 3. Decide on a serving size for people to bring. If everyone brings enough for the whole party you'll have LOTS of leftovers. I find it helpful to know how many servings to make (i.e. enough for 4-6). I like the idea of a potluck but my entire family is coming from out of state and we have about five people on our guest list who live under an hour drive from our wedding site. I love the idea of giving a serving size- I always bring enough for everyone at the party, and that multiplied by even half of the guests is way too much. And food safety is a must!!!! Nobody will want to remember your wedding by the lovely food poisoning they got there. I'm not sure how to handle that one other than to include food safety tips with the instructions and to keep the person in charge aware of reminding everyone. This is a fantastic idea, especially if you are having a smaller wedding. It sounds like all the suggestions are good ones. One more to add, make sure that your guests put their names on the bottom of the serving dish they bring their food in (with a sticker). Some may bring disposable containers, but some of them may want theirs back. I would include instructions along the lines, if they want their serve ware back, to put their name on the bottom. This post was quite a while ago, but I just want to share my recent experience throwing a potluck wedding for anyone reading this to get advice. 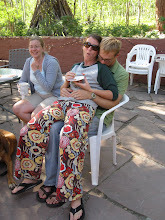 As I was planning our potluck wedding, I often referred to this site since potluck wedding advice is pretty hard to come by. 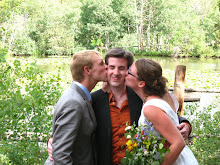 I was all for the idea of a potluck wedding from the beginning, up until the day of the wedding (last weekend, July 3rd 2010). All the advice on this blog is super helpful, but the biggest lesson I learned last weekend was to that I should have understood my own limits. Looking back, the only thing I'd change about my wedding is that I would have prioritized in our budget hiring a caterer instead of trying to do a potluck combined with doing our own food (we also provided grilled salmon, asparagus, drinks, and appetizers). We followed a lot of the advice on throwing a potluck wedding, but when it came down to it, it was just too many details and logistics to deal with on the day of the wedding. Some people are fully capable and love to think of every detail, have humongous lists of delegated tasks, etc.- turns out that is NOT me! Oddly enough, that is definitely my style at work, but it just didn't end up working that way for my own wedding. I wish I would have thought harder about all that would be involved before I committed to this type of reception. It's a great idea - but it turns out that it takes a lot more work to do the non-traditional than the traditional!